I don't remember any such conclusion being reached. Personally I'd much prefer that there were no limitations on what can be discussed here, provided it is done politely. Sorry, I don’t think this Forum is the place to promote Brexit views or events, either for or against. Anymore than we should get on to fox hunting, badger culling, the NHS, immigration etc. Let's keep this Forum for GWR related issues (or related light-hearted and related diversions) - which I think was a conclusion from our day at Westbury. And I'm coming at this from a third angle. Unless I'm being blind, I don't see anywhere this thread has turned into a discussion about the right and wrongs of Brexit. It's about a special train - perhaps the very first IET charter that GWR have run. It's about crowd and passenger control and flows on the railway, and how and when special trains are flagged up. I ask myself "what if the train was carrying people to a demonstration in favour of renaming Mars Bars to Venus Bars" or "what if the train was carrying Everton fans [Liverpool supporter here]" ... I suspect the discussion would have been just the same. This is posted in "London to Swindon and Bristol" and it is about a train from Bristol to London (I think we allow versa vice, especially as it returns later in the day). There are ... other ... places on the Coffee Shop where wider discussions including Brexit concerns may be politely discussed - for example the business of ensuring that enough spares are available for GWR trains if the whole thing goes messy, and whatever happens in the next month the impact on GWR of changes in passenger flows brought on by economic changes. However, I'm just expressing a view, quite relaxed about it really. My turn to bold ... I wrote "Intent of the trip is to let you join " and not "Intent of the post is to let you join " ... and went on to talk about the rail aspect. Very much aware I was sailing close to the wind. "HOWEVER .. it's a GWR special ..."
Also relaxed ... and NOT travelling on that train. My Facebook feed is filled far too much with views in all directions and I've other things to do that protest one way, protest the other way, or not protest because the folks who are doing it have it right. Due to a fault with the signalling system at Bath Spa fewer trains are able to run on all lines. Disruption is expected until the end of the day. 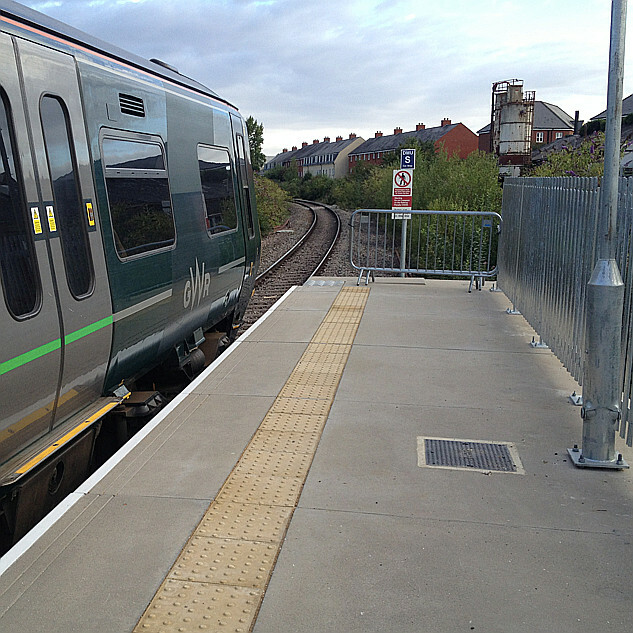 Train services between Bristol Temple Meads and Swindon may be delayed or diverted. Owing to a problem with the signalling system there will be a reduction in the frequency of train services between Swindon and Bristol Temple Meads (in both directions) which are able to serve Chippenham and Bath Spa. Would customers intending to join train services at Bath Spa should note that services will almost certainly be using the opposite platform to normal - customers are requested to ensure that they check the station information displays. Problems with the signalling between Bathhampton and Bath Spa. Down trains are using the up line and up trains are using the down. Just to add to the mix Cross Country services are being diverted along the Avon Valley today. I'm on the 0900, we've been diverted via parkway. Yes this has been happening all day, with eastbound services stopping on the opposite platform to usual at Bath Spa, and westbound services stopping on the opposite to normal as well. I don't actually understand why that happened. I can understand that there have been signalling problems all day. But why should this lead to having to use the wrong platforms for all services? I can understand services having to use the opposite platform because the other can't be used, but it obviously could be used and was being so. 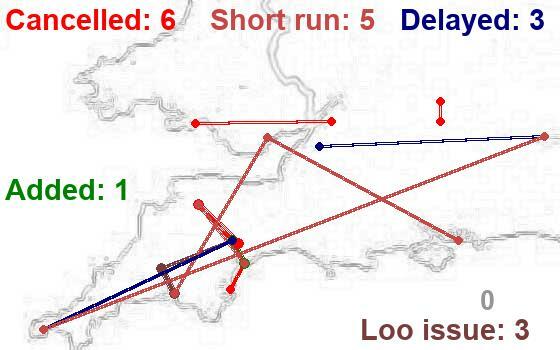 I can't understand how a signalling problem could cause trains to have to cross over - have the signals somehow got a mind of their own and decided to swap sides? My guess is that one of the crossovers at Bathampton or just west of Bath got stuck, or had to be clipped, so all trains had to cross over there. They then all have to cross three miles away as well, and the question arises what to do with the other direction. While that stretch could be operated single line, making both directions cross and re-cross probably causes less conflict and simplifies things at Bath for passengers and staff. Agreed. Or perhaps it really is a signalling system fault and one direction cannot run on its normal side. Double crossover is messy, but probably leads to less capacity loss than single line working, as well as spending the crowds at Bath station over 2 platforms, and with the ability for both platforms still to be loading / unloading at same time. Noting the problem continues today (Sunday 24th). The problem affects at least one signal on the down line between Bathampton and Bath Spa. To allow technicians the chance to work on it, it is easier to use operate the line in the opposite direction using the reversible signals. The alternatives would either be single line working on the up line or talking past one or more signals on the down. Both would lead to greater delays. I believe the problem was a ‘wrong side’ signal failure - when a signal displays an aspect or gives an indication that is less restrictive than it should be. Thorough testing required when that sort of thing happens. Not sure if it’s connected with the upcoming resignalling? Oh well; can't blame Jeremy Corbyn - he was, er, elsewhere - as usual.